Selah (Say-la) Villa, one of our newer 4 bedroom Runaway Bay villas, sits on the sea where the waves gently break on shallow reefs and roll in providing their own music. Runaway Bay is the place the sugar plantation slaves escaped in the bygone slave era of Jamaica. The beach is one mile of white sand for sunbathing, strolling and swimming. Selah is located on the eastern end of the beach on a cove across (400 yards) from the new Jewel Paradise Cove Beach Resort and Spa. Near enough to access the amenities, far enough to be private and escape the crowds. Selah is situated on the edge of a natural mangrove forest, hundreds of years old, which is home to doves and local bird life. The designer, Architect – Jeremy Millingen’s international experience was challenged to achieve the mandate of the owners to design a home that is beautiful, charming and cool. When you visit let us know whether Jeremy succeeded. The villa is furnished in British Colonial tradition with rich mahogany and luxurious fabrics. The living room and dining room areas open onto a large covered veranda and then to the pool and beach. The upstairs living room gives an additional, more private seating area. This common area also has a computer and fax. See additional interior photographs. The villa is located on a fantastic, private, white sand beach (220 feet) with excellent swimming. The pool is fresh water and 20 x 40 ft. 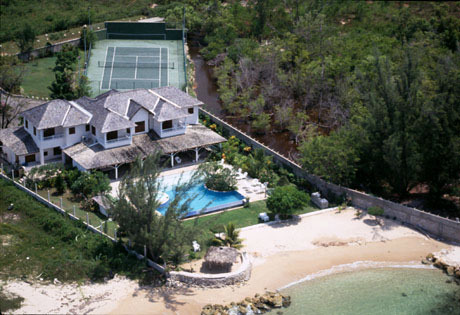 The villa has an excellent lighted tennis court and two kayaks for your enjoyment. See additional exterior photographs. The four spacious bedrooms are beautifully furnished and all have spectacular ocean views. Each bedroom has air-conditioning, ceiling fans, balcony and private bathroom. -Master Bedroom mahogany four poster king bed, French doors to ocean front balcony, en-suite bathroom. The villa has a full staff of four; cook, caretaker, laundress, housekeeper. Four Air Conditioned Bedrooms with Ceiling Fans and Bathrooms each with its own balcony. Staff of four (cook trained to please, caretaker, laundress, housekeeper). The owner requests pre-payment of staff tips: 15% in the Low Season and 10% in High Season.